There are two types of people in this world: those of us who would approach this mask with torches, pitchforks, and an angry mob; and those of us who would simply run, screaming for the hills! Well, look at that, it seems we have misplaced our angry mob…AHH! Let's run! 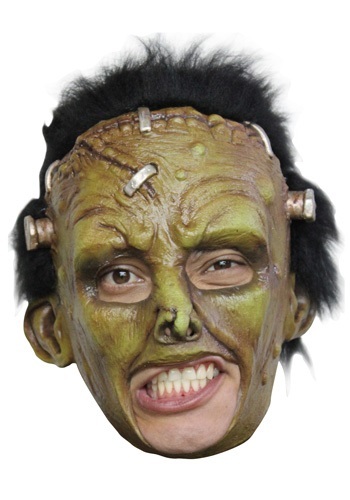 No matter which type of person you are, you can’t deny the sheer terror of this Deluxe Frankie Mask! The color of this mask is a molded mix of green and brown, with silver stitches on the top of the head and rusty, silver bolts on each side of the mask. There are large openings for the eyes and the mouth, with discreet holes in the nose. Plus, there is a thick mane of black hair attached to the top of the mask. This mask is great for scaring random citizens or, better yet, dancing the monster mash with your fellow ghouls and ghosties!